We’re out of town for the weekend, but that’s not going to stop us telling you about the great music that’s on. In fact, we’re going to bring our normal timings a day earlier and start the post off from bands playing Wednesday night, since there’s some great gigs going on then that we’re gutted we’re going to miss out on. Octopuses, Becky Becky and Do You Feel What I Feel Deer? 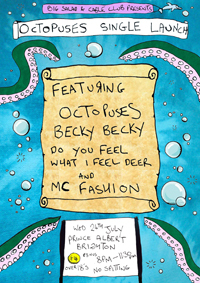 are all on the bill at the Prince Albert on Wednesday night for the launch of Octopuses new single Sarcastic. At the Blind Tiger you can see Faux Flux, Luo and Spacenoid, and you can see The Beautiful Word at Northern Lights. Skipping to Friday Night, Eliza Jaye holds her album launch at the Ranelagh, and at the Blind Tiger there’s this month’s Les Enfants Terribles, featuring Bad for Lazarus, Fox in the City and The Frenzied Anaesthetist. Unfortunately Fear of Men supporting Youth Lagoon has been rescheduled so if you were hoping to see them you’ll have to wait until October. We’ve already mentioned Saturday night RSPB Fundraiser at Saint Luke’s Church with Mary Hampton and Do You Feel What I Feel Deer? 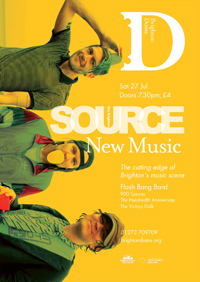 Saturday is also this month’s Source New Music at the Dome Studio Theatre – Flash Bang Band headline, with support from 900 Spaces, Hundredth Anniversary and The Victory Dolls. Meanwhile, at the Green Door Store Gnarwolves host the launch party for their new EP Funemployed. This entry was posted in Uncategorized and tagged 900 Spaces, Bad for Lazarus, Becky Becky, Blog, Brighton, Do You Feel What I Feel Deer, Eliza Jaye, Faux Flux, Flash Bang Band, Fox in the City, Gig, Gnarwolves, he Frenzied Anaesthetist, Hundredth Anniversary, Luo, Mary Hampton, Music, Octopuses, picks, Spacenoid, The Beautiful Word, The Victory Dolls, Weekend by brightonmusicblog. Bookmark the permalink.